ASA Articles - "Your roof is our reputation!" 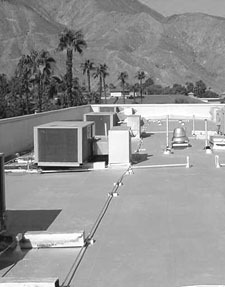 The internet can help you manage your store's roof asset information successfully. Only the knowledge of real-life effects of exposure on a roof system can determine the life span of your roof. Early diagnosis of deficiencies and timely repair ensure a long life for your roofs. Proper roof design and effective roof drainage can solve the problem of ponding water. Giving consideration to climate, conditions and building specifics prior to the design stage can lead to long-term performance of a roof system. Using leak information to assess your roof's condition. Managing and preserving roofing assets. Asbestos has become a troublesome item that often carries a hefty price tag, but it is something that cannot be ignored. The hazard of phenolic foam insulation metal deck corrosion.